In the past, Symfony had to be installed manually for each new project. Now you can use the Symfony Installer, which has to be installed the very first time you use Symfony on a computer. This command downloads the latest Symfony stable version and creates an empty project in the myproject/ directory so you can start developing your application right away. Congratulations! 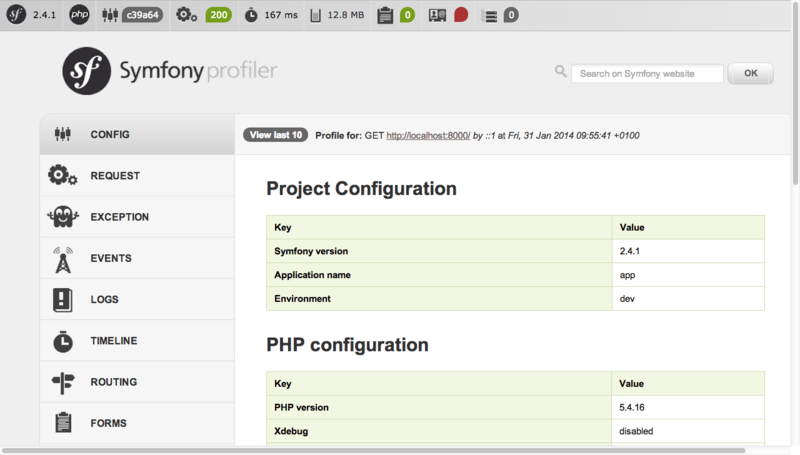 Your first Symfony project is up and running! Instead of the welcome page, you may see a blank page or an error page. This is caused by a directory permission misconfiguration. There are several possible solutions depending on your operating system. All of them are explained in the Setting up Permissions section of the official book. When you are finished working on your Symfony application, you can stop the server by pressing Ctrl and C.
If you prefer a traditional web server such as Apache or Nginx, read the Configuring a Web Server article. When developing a Symfony application, your responsibility as a developer is to write the code that maps the user's request (e.g. http://localhost:8000/app/example) to the resource associated with it (the Homepage HTML page). The code to execute is defined in actions and controllers. The mapping between user's requests and that code is defined via the routing configuration. And the contents displayed in the browser are usually rendered using templates. When you browsed http://localhost:8000/app/example earlier, Symfony executed the controller defined in the src/AppBundle/Controller/DefaultController.php file and rendered the app/Resources/views/default/index.html.twig template. In the following sections you'll learn in detail the inner workings of Symfony controllers, routes and templates. The methods defined in a controller are called actions, they are usually associated with one URL of the application and their names are suffixed with Action. In this example, the Default controller has only one action called index and defined in the indexAction method. In this example, the index action is practically empty because it doesn't need to call any other method. The action just renders a template with the Homepage. content. The first value of @Route() defines the URL that will trigger the execution of the action. As you don't have to add the host of your application to the URL (e.g. 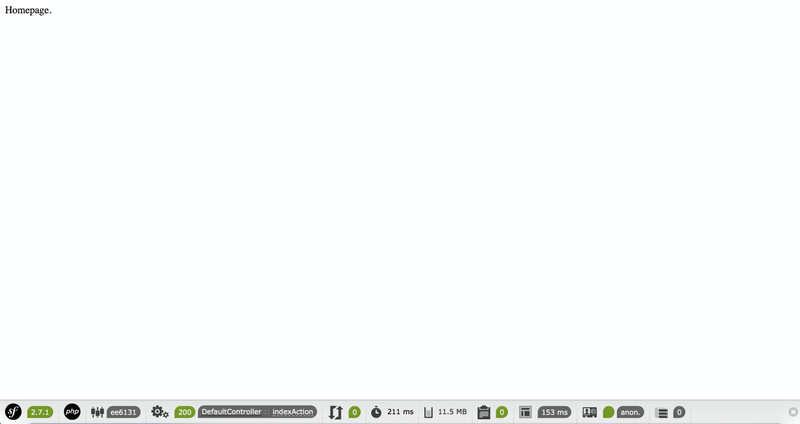 `http://example.com), these URLs are always relative and they are usually called paths. In this case, the /app/example path refers to the application homepage. The second value of @Route() (e.g. name="homepage") is optional and sets the name of this route. For now this name is not needed, but later it'll be useful for linking pages. Considering all this, the @Route("/app/example", name="homepage") annotation creates a new route called homepage which makes Symfony execute the index action of the Default controller when the user browses the /app/example path of the application. In addition to PHP annotations, routes can be configured in YAML, XML or PHP files, as explained in the Routing chapter of the Symfony book. This flexibility is one of the main features of Symfony, a framework that never imposes a particular configuration format on you. The $this->render() method is a convenient shortcut to render a template. Symfony provides some useful shortcuts to any controller extending from the Controller class. This template is created with Twig, a new template engine created for modern PHP applications. 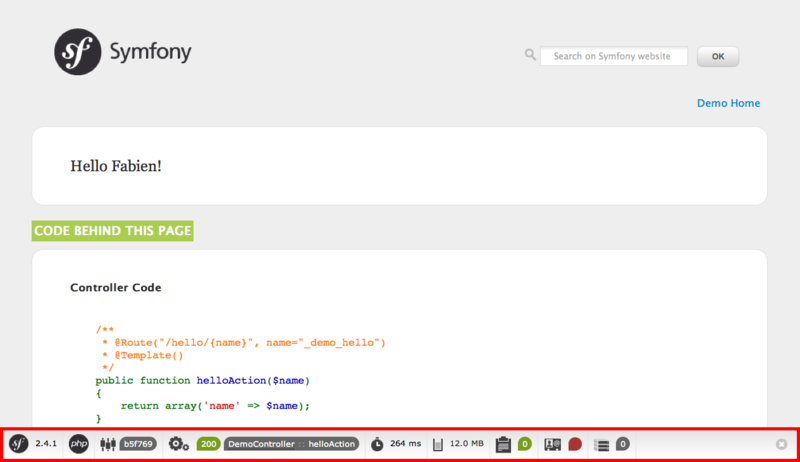 The second part of this tutorial will introduce how templates work in Symfony. For more details on environments, see "Environments & Front Controllers" article.